Exclusive £25 Gift Card with Upfront Bookings Over £850 at easyJet Holidays Enjoy a £25 digital gift card with bookings over £850 at easyjet Holidays. Once your purchase has been verified, we'll email you how to claim. Kids Stay Free on Selected Bookings at easyJet Holidays - Includes School Holidays and May Half Term Check out the range of holidays that offer free accommodation for children under 12! £40 Student Discount on Bookings Over £800 at easyJet Holidays Don't miss out on a great holiday deals from easyJet Holidays. Grab your passport and Student Beans ID now! Extra £15 Off with Price Match Guarantee at easyJet Holidays Find the same holiday with the same easyJet flights and accommodation, and easyJet Holidays will match the price, plus you'll be rewarded with a £15 extra discount. Last Minute City Breaks from £102pp at easyJet Holidays From Barcelona to Krakow, book your last minute city break for less at easyJet Holidays. 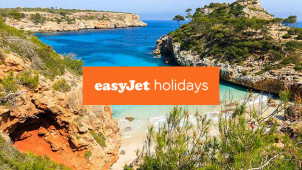 Deposits from £60pp at easyJet Holidays If you're feeling the pinch and payday feels like an age away, you can still book your easyJet Holidays with the low £60 deposits! When it comes to low-cost flights, cheap package holidays and the very best destination choices - easyJet is your ticket out of here! The low-fare airline really knows how to do things right, inspiring all kinds of travellers to explore the rich culture of Europe and North Africa. From cosmopolitan city-breakers to sun-worshipping holidaymakers; everyone can find an adventure that’s accessible and affordable with an easyJet voucher code for even simpler booking all year round at easyJet.com. easyJet holidays gives you all the freedom to plan and create the holiday you really want, with the straightforward, all-in-one booking to make your holiday run smoothly. No frantic searching through your email inbox to find hotel and transfer reservations, just one, all-inclusive booking. Select your flights, before selecting the hotel, transfer, car rental or insurance you require. Unlike other package holiday travel operators, none of these are compulsory additions to an easyJet holiday package - so you can create and pay less for the holiday you really want! How do I use my easyJet promo code? Click ‘Book Now’ and all you need to do is look forward to your holiday! For the best deals, be flexible with your dates. By considering a break within 4-week window, you’ll be able to find the best price for your holiday, and save more money to spend at your destination. Find travel inspiration with the easyJet Route Map to guide you to your next destination. That way, you can consider all 830 routes, before you start planning your next European escape. How do I check online with easyJet? Go to the easyJet website, and login to see all of your booked flights. Check the details, before hitting ‘Check in’ for each passenger. You can check in for all flights up to 30 days ahead of your departure date, saving you the hassle of hunting down a printer on holiday. When you book your flight, you’ll be given the option to add hold luggage. There are 5 options ranging from 20 kg - 32 kg, the cheapest being the lightest hold bag at 20 kg. It’s important you stick to the allowance you pay for, because overweight suitcases are a costly start to your holiday! How do I contact easyJet? You can also send your question using the online form here. Check out easyJet's Facebook page for some great deals! easyJet is famous for putting flights within everyone’s reach, offering a huge range of low price flights to destinations across Europe, North Africa and the Middle East. If you want to get away from it all this summer, this is the place to start — you'll be just a few clicks away from a city break or family holiday in the sun! You could cut the cost with an easyJet promo code and enjoy your holiday without losing track of your budget. Just book a last minute trip or even a 2019 easyJet flight online with vouchercloud today! An estimated 70 million passengers fly with easyJet each year, making them Europe’s leading airline for this year and the next if you're booking with your easyJet vouchers and beyond. What’s more, an estimated 300 million people live within a one-hour drive of an easyJet airport. They’re not called easyJet for nothing! Head to the beach this summer for a reinvigorating break that’ll set you up for the rest of the year. Holidays to Cyprus are a great way to escape without overspending, and spend your days lying on the beach with a cocktail and your evenings enjoying the nightlife with a cocktail. Buy with an easyJet discount code from vouchercloud and you won’t have to remortgage your house to afford an amazing time away.